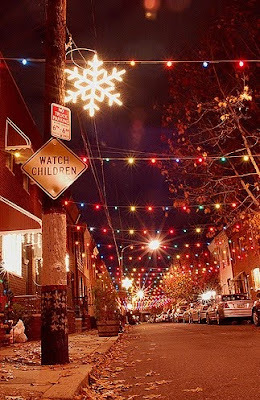 Before anything else, there's no shortage of, er, special things about your narrator's native corner of the world, but several of the most priceless tend to come this time of year. On the bright side, Christmas doesn't end on 25 December 'round these parts... more to the point, though, try telling the folks that (at least, liturgically) Epiphany is the Sunday between the 2nd and the 8th, and you get looked at like you have seven heads. Does this mean that the faithful still attend Mass on the 6th? Well, no. But on one memorable Epiphany Sunday, a homilist's mention that, as opposed to 12 Days, it probably took the Magi some years to reach the Babe proved too much for one congregant to take -- she stormed out, and for years afterward, maintained (loudly) that she had been scandalized. This all just goes to prove again what's long been known on the ground: as the sensus fidelium goes, you'd be hard pressed to find a purer barometer than River City Italians... and a tougher crowd, to boot. That said, these Christmas days are -- well, should be -- uniquely festive for these shores, in that the calendar highlights the lives of three American saints... the grandest of whom -- at least, as the world goes -- was no high-hat, but American Catholicism's "founding mother." This year, as each of the three-day string of feasts has an added significance, they merit special mention... so let's give it. The first, of course, came yesterday with the commemoration of Elizabeth Ann Seton -- the first daughter of the American continent to attain the honors of the altar when she was canonized by Paul VI in 1975. Wife and Mother of five; Teacher, Convert and Foundress of the Sisters of Charity (the nation's first community of women religious), this year's feast bears particular attention given two developments relating to Mother Seton's roots in the Episcopal church: Rome's recent initiative to welcome Anglican groups into the Catholic fold, and no less significantly, the Episcopalians' decision last year for Seton to be included on their own calendar as well, celebrating her feast for the first time yesterday. Saint Elizabeth Ann Seton is an American. All of us say this with spiritual joy, and with the intention of honoring the land and the nation from which she marvellously sprang forth as the first flower in the calendar of the saints. This is the title which, in his original foreword to the excellent work of Father Dirvin, the late Cardinal Spellman, Archbishop of New York, attributed to her as primary and characteristic: «Elizabeth Ann Seton was wholly American»! Rejoice, we say to the great nation of the United States of America. Rejoice for your glorious daughter. Be proud of her. And know how to preserve her fruitful heritage. This most beautiful figure of a holy woman presents to the world and to history the affirmation of new and authentic riches that are yours: that religious spirituality which your temporal prosperity seemed to obscure and almost make impossible. Your land too, America, is indeed worthy of receiving into its fertile ground the seed of evangelical holiness. And here is a splendid proof-among many others-of this fact. 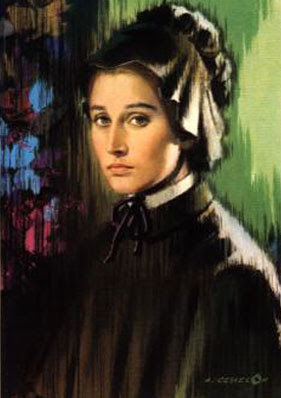 Saint Elizabeth Ann Seton was born, brought up and educated in New York in the Episcopalian Communion. To this Church goes the merit of having awakened and fostered the religious sense and Christian sentiment which in the young Elizabeth were naturally predisposed to the most spontaneous and lively manifestations. We willingly recognize this merit, and, knowing well how much it cost Elizabeth to pass over to the Catholic Church, we admire her courage for adhering to the religious truth and divine reality which were manifested to her therein. And we are likewise pleased to see that from this same adherence to the Catholic Church she experienced great peace and security, and found it natural to preserve all the good things which her membership in the fervent Episcopalian community had taught her, in so many beautiful expressions, especially of religious piety, and that she was always faithful in her esteem and affection for those from whom her Catholic profession had sadly separated her. Second, today's feast sees the 150th anniversary of the death of John Nepoumecene Neumann, fourth bishop of Philadelphia -- and not just the lone Stateside high-hat to rise to sainthood, but the lone American male, period, on the rolls for 32 long years, a distinction now in the past thanks to October's canonization of Hawaii's beloved leper priest, Father Damien deVeuster. The first Redemptorist to be professed in America -- and the importer to these shores of his Bohemian boyhood's cherished custom of the Forty Hours -- Neumann's diocese encompassed the eastern half of Pennsylvania and all of Delaware, but having been forced to accept the episcopacy under obedience, he spent most of his eight-year tenure begging for a poorer, simpler posting. True humanism is Christianity. True Christianity -- we repeat -- is the sacrifice of self for others, because of Christ, because of God. It is shown by signs; it is manifested in deeds. Christianity is sensitive to the suffering and oppression and sorrow of others, to poverty, to all human needs, the first of which is truth. 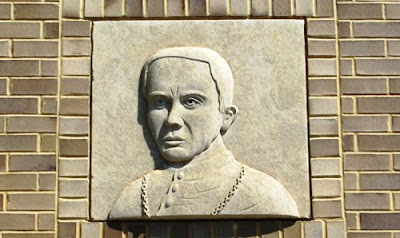 Having built the nation's first diocesan school system (and long its strongest) as an alternative to his see city's Protestant-run public schools, the face of the saintly bishop is shown above on a wall outside the high school for boys that bore his name for half a century. In an emblematic coda of what happened to John Neumann's Philadelphia, the famous building at 26th and Moore -- built to hold over 3,000 students -- dismissed its last classes at mid-decade, and has since been converted into a residence for senior citizens. And lastly, while the church elsewhere -- alongside Italians, Latinos, etc. 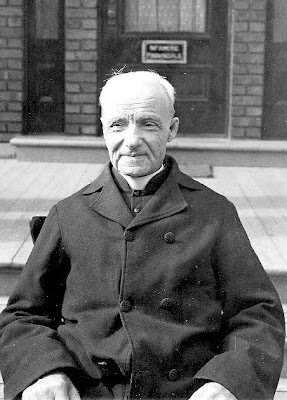 here at home -- celebrates Epiphany tomorrow, the American calendar provides a feast likely to garner a bit more notice this year given last month's news that a final miracle had been approved to secure the canonization of Quebec's miracle-worker of the early 20th century, Blessed Andre Bessette. The slight, sensitive, little-educated Holy Cross brother -- who served as his community's doorkeeper for four decades -- drew crowds in life for his repute in entrusting intercessions to the successful patronage of St Joseph. In time, the mountain of favors built a "miracle": the Montreal oratory to which the struggling and downhearted still flock, and where the saint-to-be's tomb bears the humble inscription "poor, humble, obedient servant of God." Sure, it might seem an overly pietistic, maybe even hokey, exercise to note these observances. Yet as the passage of the years can often make it all too easy to glide through the calendar without thinking terribly much about it, that pretty much defeats its purpose -- to call us away and remind us of what's important... that is, what lives, lasts, and for everything else we've got on our plates, really makes a difference. It's always said that "there's no time like the present." That's truer still at the start of a New Year, and while we're all in the spirit of resolutions and fresh starts, it's fairly providential that their first days always offer the chance not to focus on distant Medieval pontiffs or potentates, but our accessible own -- people who might've walked the streets we know and faced the challenges some our own still do, but without leaving their time and place, were able to have a timeless impact: one born less of the loudest voice, the busiest mind or the strongest opinions than the simple spirit of faithful selflessness to which all of us remain called. Like a single point hit from different angles, each of the saints offer us an example... but maybe just as important, they provide a gift no shortage of us can take comfort from in this moment of history: perspective. And perseverance, too -- God knows a lot of us could use that. Bottom line: whatever we seek in their lives and lessons we'll almost always find... what matters most, though, is that we make the effort. Listecki to Milwaukee: "Do You Love Me?" Brewerland Word of the Day: "Witamy, Arcybiskup"
Born for Us... "The 'Us' of the Church"